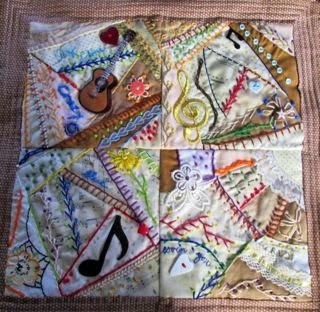 Anne's Notes from the Woodshed: "Crazy" Crazy Quilt is done! 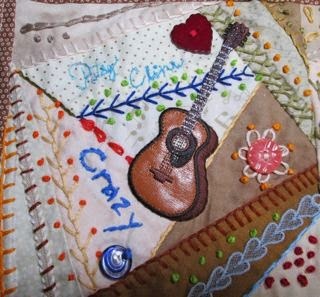 "Crazy" Crazy Quilt is done! 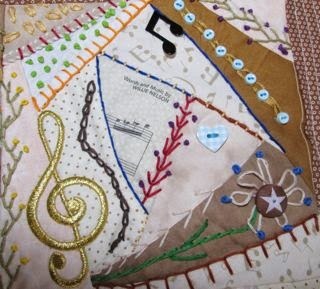 A year ago Tacoma Lakes Quilters challenged its members to create a quilt based on a song from the 50s-60s. 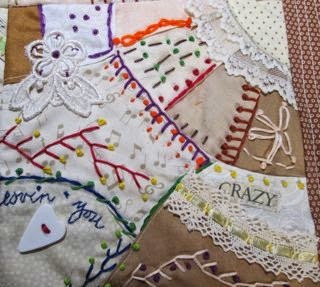 I knew I wanted to use Patsy Cline's "Crazy" in a crazy quilt but I had no idea how to do that. I spent the year collecting ideas, fabric, embroidery thread, etc. I took an on-line class in mid-March at Craftsy on crazy quilts and got started with this project about two weeks ago. One of the things I figured out was how to stiffen fabric enough to run it through my printer so I could print out the sheet music to use as one of the eleven fabrics for each block. I also learned the embroidery stitches and practiced on these four blocks. I used three different methods for the four blocks--flip and sew, curved piecing, and applique piecing. 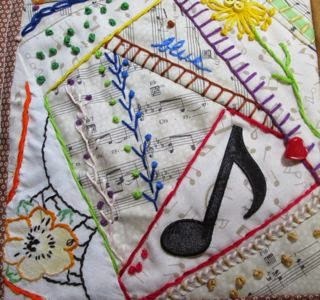 I really enjoyed working on this project and I imagine this is the first of several crazy quilt projects I will tackle.